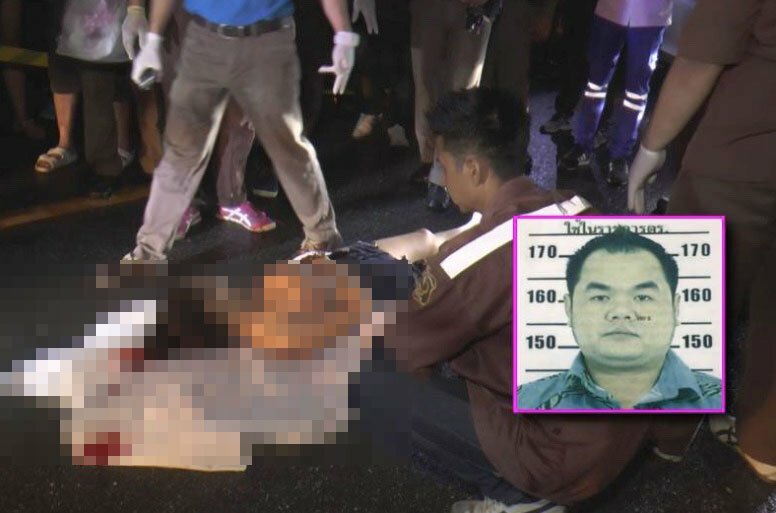 More details have emerged in the slaying of attractive restaurant receptionist “Nong Nurse” gunned down in her red plate car in Nakorn Pathom. She had a boyfriend from the Netherlands who was regularly sending her money and visiting her every three months. The Nakorn Pathom court yesterday issued a warrant for the arrest of Wallop “Lop” Huayhongthong on murder and gun charges. He had been the boyfriend of Noppathorn “Nurse” Kanokkasemsophon for the last nine months. But he found out that she was carrying on with another man behind his back and went to a house where he found the pair together. Pol Col Phaitoon Phitaktham of the Muang Nakorn Pathom police revealed more details of the case to Daily News. The victim had two children but her family home in Ratchaburi broke up and she went to work in Pattaya. There she met a man from the Netherlands who sent her money every month. He also visited Nurse every three months. The man she was seeing in Nakorn Pathom is a different man. Daily News called the alleged murderer “Sia Lop” in their headline indicating that he is a man of means. They said the victim was an attractive woman.